1. McCosh had acknowledged, in a previous book (The Method of Divine Government) published 8 years before Darwin’s Origin of Species, that God’s Providence was manifested, at least in part, through natural laws. It was this work that allowed him to tentatively agree with much of Darwin's theory: just as God's Providence was manifested through physical laws like gravity, so too could it be manifested through evolutionary laws. 2. If ‘properly understood’, there was nothing inherently atheistic about evolution. McCosh did not unreflectively accept every part of Darwin’s theory (and in another paper points out both its weaknesses and strengths, while acknowledging that the weaknesses could be purged by new discoveries as the science matured), but sought to discover its ‘proper limits’. 3. 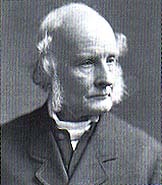 McCosh was afraid, when coming to America in the 1860s, about communicating his evolutionary leanings to his peers. 4. These misgivings were unfounded – contrary to the assumptions we might have about evangelicalism in America in the late 1800s, the numerous churches he preached evolution in did not ‘assail him’ but rather respected him and his teachings, and many came around to his point of view. 5. Despite this, there was still much anti-evolution sentiment in America. But in his opinion, much of it was grounded in ‘the bad use to which the doctrine has been turned’. 6. Finally, and most interestingly to me, McCosh's fear was that anti-evolutionary teachings would cause students to lose their faith. This is exactly the opposite opinion of today’s Creationists, who blame loss of faith on evolutionary teachings and a lack of sound Creationist principles being taught in the church. How was McCosh able to present evolution to an evangelical audience, in a manner that they found palatable? That will be the topic of a future post. For now, enjoy the insightful introduction to his Religious Aspect of Evolution, published in 1890. “In my first published work, ‘The Method of Divine Government,’ I sought to unfold the plan by which God governs the world, and I found it to be an orderly manner – that is, by law. As having pursued this line of research, I was prepared to believe that there might be the like method in the organic kingdoms, and to listen to Darwin when he showed that there was a regular instrumentality in the descent of plants and animals. I noticed that he and others, such as Lewes, Huxley, and Spencer, who took the same view, were not swayed by any religious considerations, and that religious people generally were strongly prepossessed against the new doctrine. But I saw, at the same time, that Darwin was a most careful observer, that he published many important facts, that there was great truth in the theory, and that there was nothing atheistic in it if properly understood – that is, in the acknowledged tenet of the government of organic nature by means and according to law. “I felt it to be my only course not to reject the truth because it was proclaimed by some who turned it to an irreligious use, but to accept it wherever it might lead, and to turn it to a better use. I let it be known that while I thought there was truth, I believed there was error in the common expositions of evolution, and that the work of the coming age must be to separate the truth from the error, when it would be found, I was sure, that this, like every other part of God’s work, would illustrate his existence and his wisdom. “When I was called from the Old World to the office which I now hold as president of an important college, I had to consider – I remember seriously pondering the question in the vessel which brought me to this country – whether I should at once avow my convictions or keep them in abeyance because of the prejudices of religious men, and lest I might unsettle the faith of the students committed to my care. I decided to pursue the open and honest course, as being sure that it would be the best in the end. I was not a week in Princeton till I let it be known to the upper classes of the college that I was in favor of evolution properly limited and explained; and I have proclaimed my views in lectures and papers in a number of cities and before various associations, literary and religious. I have been gratified to find that none of the churches has assailed me, and this has convinced me that their doubts about evolution have proceeded mainly from the bad use to which the doctrine has been turned. I am pleased to discover that intelligent Christians are coming round gradually to the views which I have had the courage to publish. "...the atheistic appropriation of evolution did not make the theory in and of itself atheistic." This is a line I will use whenever the issue comes up. “When I was called from the Old World to the office which I now hold as president of an important college..." This is a line I will use whenever I enter a conversation of any kind.